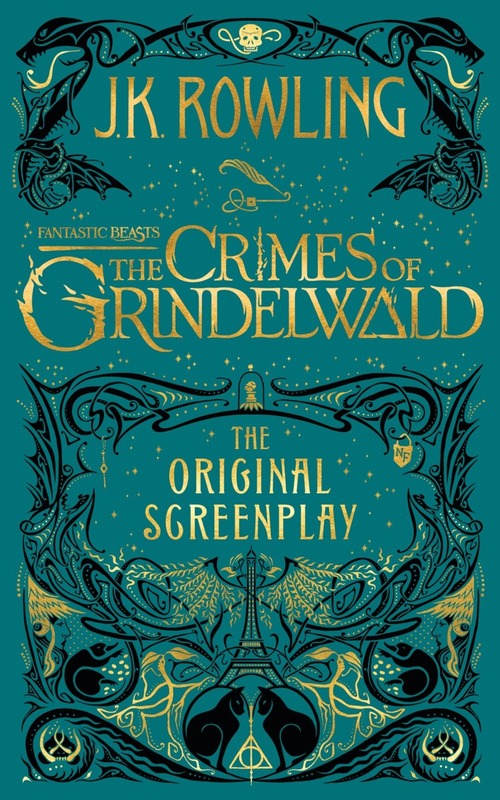 The screenplay for Fantastic Beasts: The Crimes of Grindelwald will be published alongside the theatrical release this November, and today the whimsical cover was revealed. The new cover was designed by Harry Potter and Fantastic Beasts graphic designers Miraphora Mina and Eduardo Lima. The cover is in a similar style to the first screenplay’s, but this one employs new colors and lots of new artwork. Pottermore and Mina Lima are teasing that the cover is loaded with hints and easter eggs. We can see a couple familiar beasts, the Elder Wand, the Deathly Hallows symbol, a lock with the letters “NF” (Nicholas Flamel), and possibly the Philosopher’s Stone in a case. There’s also an interesting object above the word “Crimes” — it looks like a quill, but what else is part of the graphic? The book is available for pre-order now. Fantastic Beasts: The Crimes of Grindelwald (both the screenplay and the film) will be released November 16, 2018. Editor’s note: Johnny Depp, who co-stars in this film, allegedly beat his ex-wife Amber Heard. These accusations were made by Heard and Depp’s former associates. J.K. Rowling responded to the controversy. Why are we telling you this?